Are you taking part in all the 2019 New Year’s Resolution madness? Mom and I had such a great 2018 and we have big plans for 2019! We did take a moment to reflect on our “successes” and “fails” as we learn how to navigate this crazy online world, and I have to say, we did pretty good for our first year as a company! But throughout it all – we had FUN! Mom and I created a step-by-step video Triangle Quilt Class that walks you through creating a triangle quilt from start to finish. So, look out 2019! LJQ has big plans to take our quilt patterns, tutorials, photography, community, shop, and site up to the next level! Now it’s YOUR TURN, what quilting/sewing plans do you have for 2019? Don’t be shy – spill your plans! We love hearing from you! Are there any quilting tutorials you’d like see? Do you have plans to take your shop up a level this year? Do you design quilt patterns, or does the idea of getting all “tech-y” send you back to designing on paper? As always, we so, so, so appreciate our business and support from our quilting friends, customers, and clients! 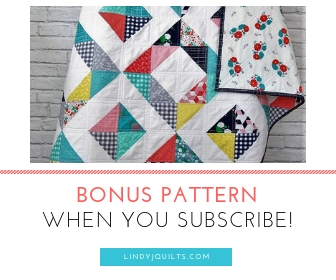 Previous PostHST Squared – A Free Quilt Pattern!